Spargel season in Germany is short-lived, but millions of people rush out to restaurants with great anticipation and to the markets and roadside stands to buy it to cook at home. We all wait for it! It is one of the wonderful specialties of spring. By regulation, German asparagus will only be served fresh in restaurants and Gasthaüser from about April 23rd to about June 23rd. After that last date, you will no longer find it on a menu as a fresh offering. Of course, you can still grow it and you can buy it, though not for much longer as, like rhubarb, the plant becomes past its prime and it also needs to rebuild food reserves for production the following year. Green asparagus is also a specialty of spring and that is the most known type in North America. It is also well known in Europe, but it's the white everyone in Germany awaits. 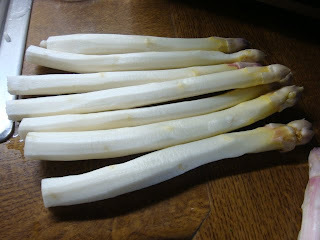 France, Italy and Spain are also known for their white asparagus. The green and the white are actually from the same plant. It is just how they are grown and when and how they are harvested that makes them different. The plant one grows for the green is generally just planted in a flat bed and allowed to grow above the ground and turn green before it is cut. Those growing a plant as white asparagus grow them in raised beds (in Germany one sees huge fields of long rows of raised soil). They are not allowed to see the light of day. When harvest approaches, the farmers are out every day at first light cutting the Spargel just as the tips come to the surface. Throughout the season workers will be seen scanning the fields and cutting. They use a special tool for that, called a Spargelstecher, a foot-long rod with a knife-like cutting end. 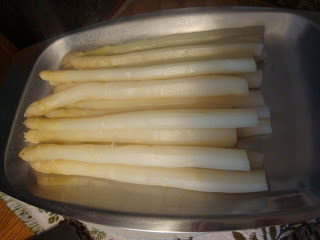 The stalks are cut off below the surface with the root left untouched (the root is left untouched with green asparagus as well). Because the asparagus never sees light, the color is white. If it grows above the soil before it is cut, then it will have a slight yellow or purplish color. Those are considered second class. Only the white and the straightest are sold as first class. On the right, a Spargel field at the end of the producing season with stalks allowed to come to the surface. They will not be used. This field is less than ten minutes from home. A few years ago we rarely saw farm stands in our area selling white asparagus (or green either for that matter), though the markets and the grocery stores did. Now we are seeing it everywhere, even in our village just down the road. It has certainly brought the price of fresh asparagus down as we no longer get it just from specialized areas. For the consumer it is great. Perhaps not so great for the areas that earlier were the main producers. 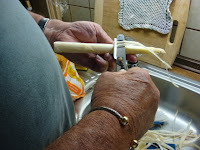 Back in the 1980s and 1990s white asparagus mostly came from four well-known growing areas in Germany: Schwetzingen, near Heidelberg, in our province of Baden-Württemberg; north of Munchen (Munich) in Bayern (Bavaria); the Bodensee region (Lake Constance) in southern Germany and the Lüneburger Heide area in northern Germany. 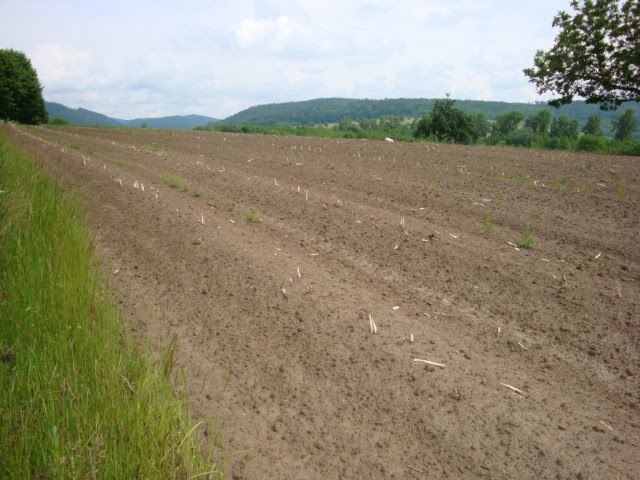 In the last few years asparagus fields have sprouted up everywhere in our own region. At left below, fresh strawberries topped with whipped cream and wild strawberries from outside our door. Wherever you see long, raised rows covered in plastic in spring, that will usually mean asparagus. That plastic covering is new in the last twenty years and helps to protect the beds from the weather and especially from the cold in early spring. During the harvest, they will be removed. Farmers and gardeners also cover strawberries with the plastic as well, as it is in season at the same time and is often the dessert at the "Spargel Essen" table. Green asparagus has a stronger taste than the white and is usually served as a vegetable side dish, while white asparagus, which is milder, is the focus of the meal and the highlight. It is all about the Spargel. Everything else is secondary. Below, a platter of freshly cooked white asparagus. 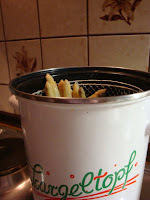 This year we have had three Spargel dinners at home. A few years ago we usually enjoyed it at a Gasthaus as many still do, but these days we generally cook it ourselves. It isn't just the asparagus itself that we look forward to each spring, but to all that accompanies it and makes it such a special meal. The main reason we have it at home is that we think it is better: we can eat as much or as little as we like, and we can have all the extras that are traditionally part of it. 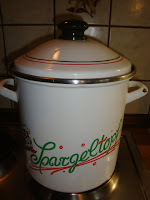 The traditional Spargel dinner is shown opposite. 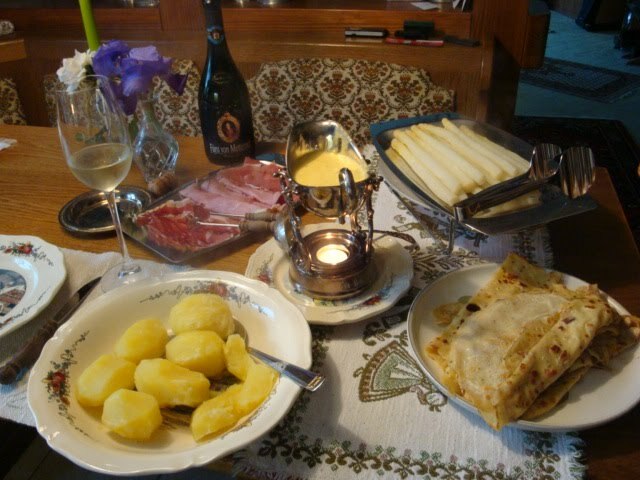 It includes three types of Schinken (ham), new boiled potatoes, Kratzete (crepes) and hollandaise sauce, all as accompaniments to the main dish: the white asparagus. With this dinner we had a bottle of Fürst von Metternich Riesling Sekt. It was excellent with the dinner. 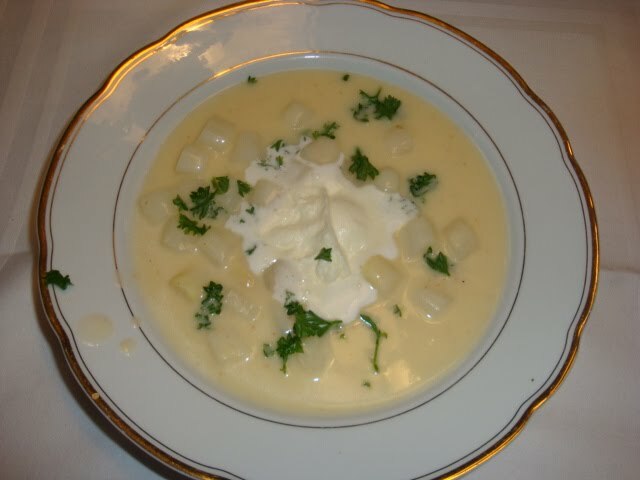 Here is what you will usually see on a restaurant or Gasthaus menu: a pound of Spargel per person (a lot and more than I can eat, but most people want that); hollandaise sauce; new boiled potatoes or Kratzete and either one or two types of Schinken or three types (smoked, unsmoked and slightly smoked). If you wish all, you will pay extra for each addition. Kratzete are crepes that are cut into strips, pulled into pieces or left whole and rolled up when served. It is my favourite part of the meal and it wouldn't be a "Spargel Essen" for me without them. Not that I wouldn't enjoy the dinner without it, but it wouldn't be the same. Along with hollandaise sauce, it is what I wait for each year. Yes, we could make crepes and hollandaise sauce any time, but the Spargel, of course, is what makes it all so perfect a meal. On the plate below, Spargel (asparagus), Kratzete (crepes), two types of Schinken (ham), a boiled new potato and hollandaise sauce. Not everyone wants the Kratzete or even the hollandaise sauce, though they are nearly always offered in Baden-Württemberg. In 1991 we were in the former East Germany in May; it was the year after German reunification. We had been there in 1990 as well, but not in springtime. Driving through the countryside east of Berlin, we came across a small restaurant with tables set outside. Spargel was advertised. We stopped and enjoyed a wonderful meal. Northeastern Germany is known for its potatoes and they were excellent. So was the Spargel. Here, they didn't serve hollandaise sauce; instead, they simply served melted butter. That is the custom there, which Hans remembered from his childhood. 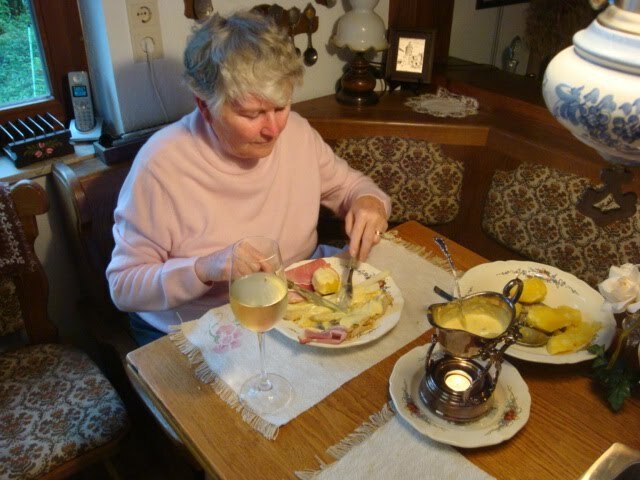 Monika, a friend of ours, always serves hers with Kraütersauce (herb sauce). We like it all ways but hollandaise is our favourite. Dinner at left with the hollandaise kept hot in a sauce boat. Years ago, Hans organized "Spargel Essen" evenings for Canadian friends and colleagues. Normally we would have about 30 people joining in on a Saturday night. Most years he organized at least two of these evenings. One of the chefs, Herr Rosen, a great cook, put on nights to remember, with all the traditional food, side dishes and extras. At the time, we paid around 18 Deutsch Mark per person--expensive even then--but much cheaper than at other restaurants at that time (and cheaper than we realized before the Euro came into being!). About five years ago, Hans' son and family flew over from Canada in the spring. Hans organized another dinner, this time at a local Gasthaus we frequent, whose chef/owner and a friend, Martin Grimm, is also a great cook. The cost then was about Euro 18, double the price compared to the Mark. One pays that today in a regular Gasthaus; more in a restaurant and only for the normal offering, not for any of the extras. A good wine is also important to serve with white asparagus. One of the best we've had is a Nobling, the grape grown in the Margräferland, a region located between the city of Freiburg and the Swiss border, about 40 minutes south of us. It is perfect with Spargel. Another we like very much is Scheurebe, another grape type; though not common in our area, some is grown. 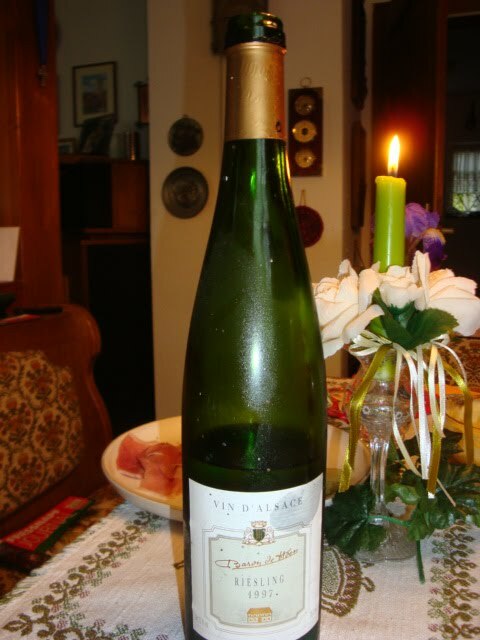 One of the best Scheurebes in our opinion comes from the Pfalz (Rhineland-Palatinate), the largest wine-growing region in Germany and about two hours northwest of us. Both these wines are strong in flavor so they vie well with the strong-flavored asparagus. Most people recommend a good Riesling and this year we did have a very nice one. It was flavorful, which is important. Some Rieslings are too dry and without enough flavor, so therefore are too weak in comparison to the asparagus. The one we had is at right and was a 1997 Baron de Hoen Riesling from the Alsace in France. A Note: We have tried freezing white asparagus and it freezes well. Just peel the fresh asparagus as you would normally do if cooking it right away. Place it in a plastic zip-lock bag or plastic container and place it in the freezer immediately. Don't cook it first. To eat it later, place the frozen asparagus into boiling water and cook until it is tender. Check for readiness as you don't want it to be overcooked. It won't be quite as good as having it from fresh asparagus, but it's still very enjoyable. 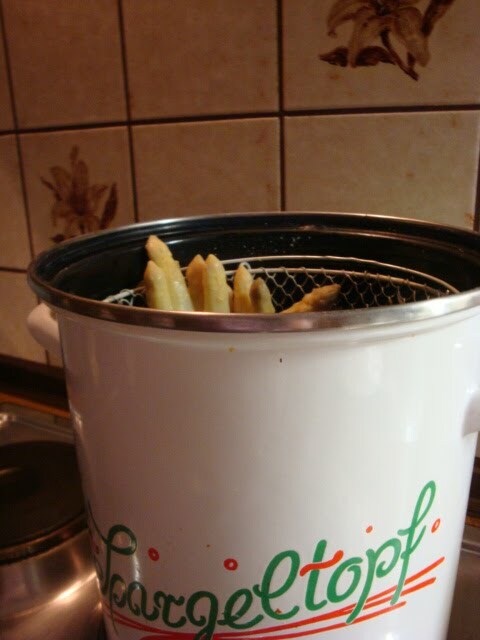 See the method below for cooking fresh asparagus. 3. Add about a tablespoon of sugar and half a tablespoon of salt to the water; the amount depends on how much asparagus and water you use. Hans usually cooks about 750 grams or a bit more for the two of us. Others add a chunk of butter as well. Hans doesn't add any butter; instead he adds it to the Spargel after it is placed on the serving platter. 4. Stand the asparagus upright in the pot. If you don't have a tall one, tie the asparagues so that they will stay upright--tips facing upwards--in the large pot you use. We have a Spargeltopf--a pot with a basket--used for cooking asparagus. (We also use it for cooking spaghetti.) Spargel must be cooked with the cover on. 5. Let the asparagus simmer well for 15 to 20 minutes. 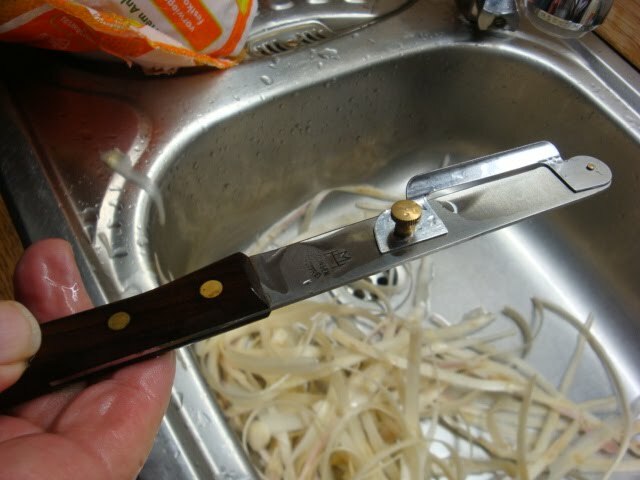 Hans suggests checking for tenderness with a fork (gently) as you would for potatoes, or you can check with the tip of a sharp knife. You can also remove a spear when you think it is ready and bite into it. You want the asparagus to be tender but not overcooked or underdone. 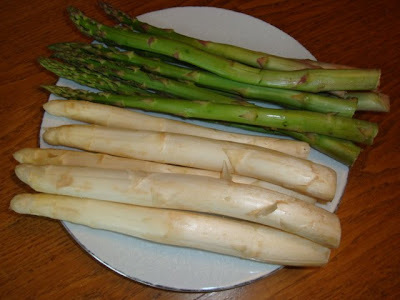 A tip: Use the peelings and a few stalks of fresh asparagus to make a stock for asparagus soup. That is what I did recently. See below. Howdy! I could have sworn I've visited your blog before but after going through a few of the posts I realized it's new to me. Anyways, I'm definitely pleased I discovered it and I'll be bookmarking it and checking back frequently! 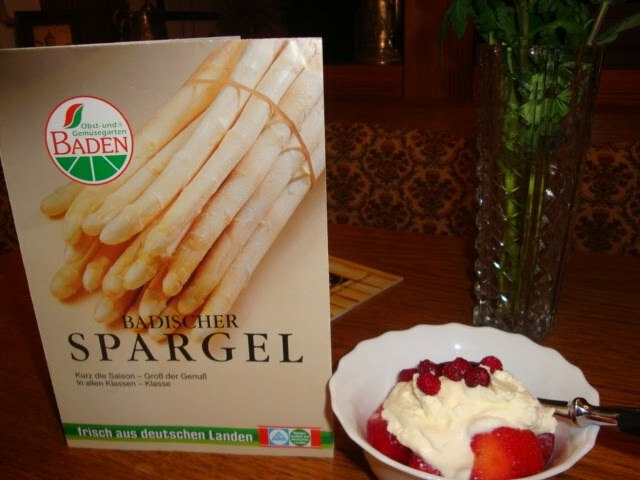 up here "Spargel: Germany's White Asparagus". And I actually do have some questions for you if it's allright. Is it simply me or does it seem like some of the comments appear like left by brain dead folks? :-P And, if you are posting on additional places, I'd like to keep up with anything fresh you have to post. Thank goodness I found it on Bing. You have made my day! Thank you again! info , thanks for posting : D.
You are so interesting! I do not believe I've truly read something like that before. So good to find another person with original thoughts on this subject. Seriously.. thanks for starting this up. This site is something that is needed on the internet, someone with some originality! Тhanκѕ for youг ρегsonal marvelous postіng! уоu're a great author. I will be sure to bookmark your blog and will come back in the future. I want to encourage you to continue your great writing, have a nice day!